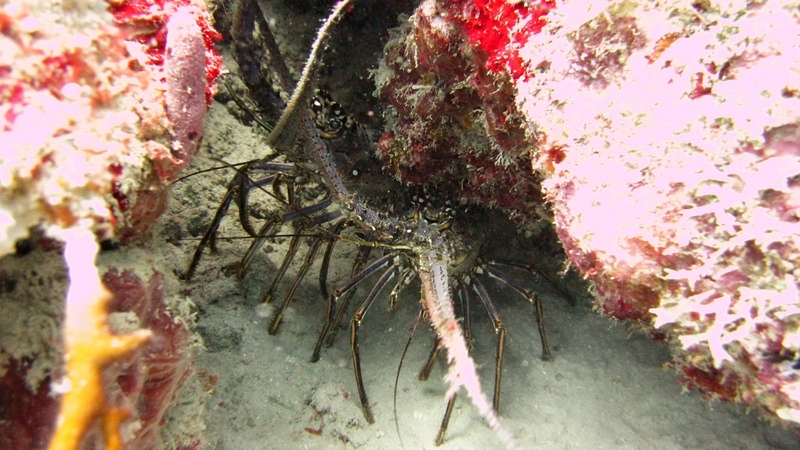 A Banded coral shrimp (Stenopus hispidus) at Black Forest. 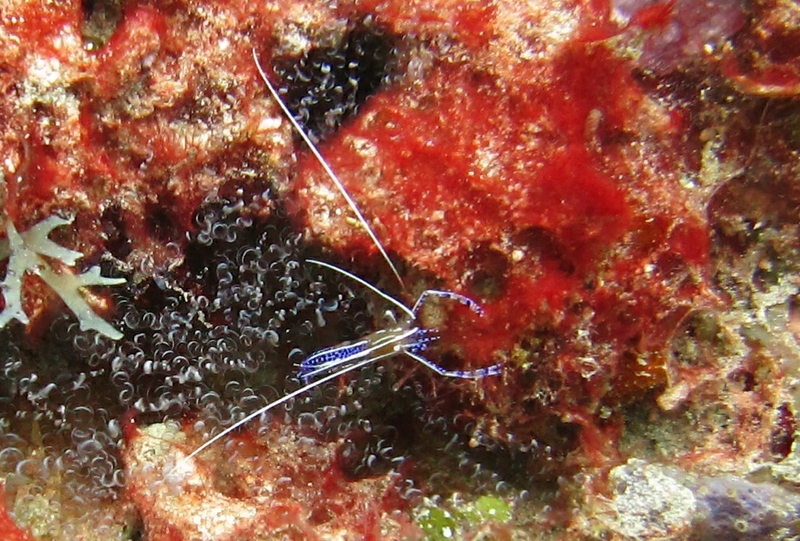 A tiny Pederson's Cleaner shrimp (Ancylomenes pedersoni), about 2cm long, at Purple Rain. 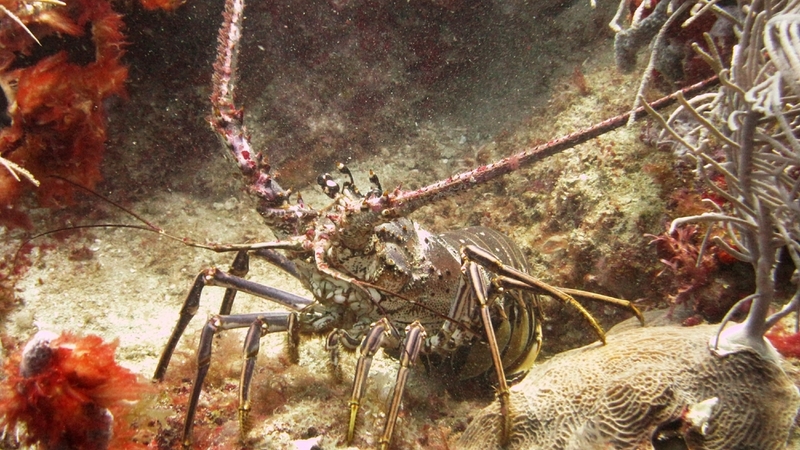 A Pederson cleaner shrimp and an Arrow crab at Black Forest. 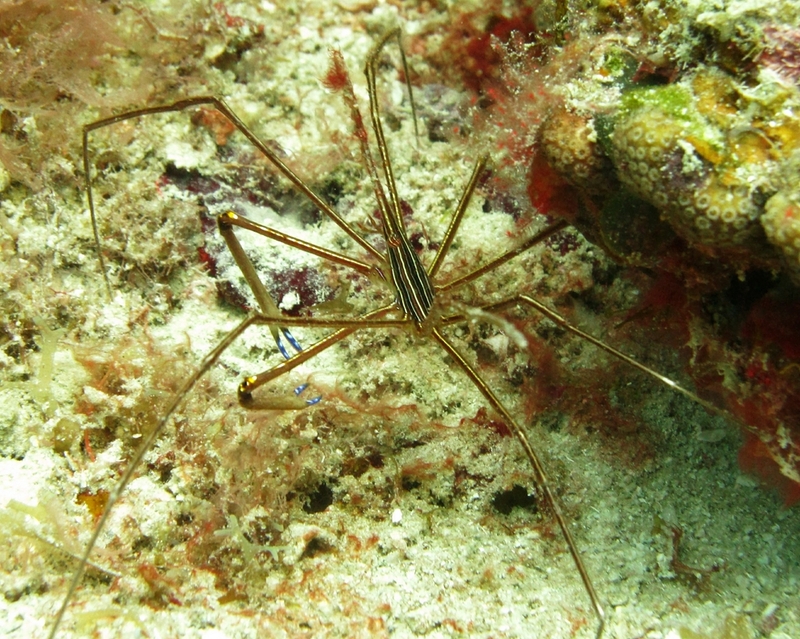 A nice Arrow crab (Stenorhynchus seticornis) at Quarter Wreck. 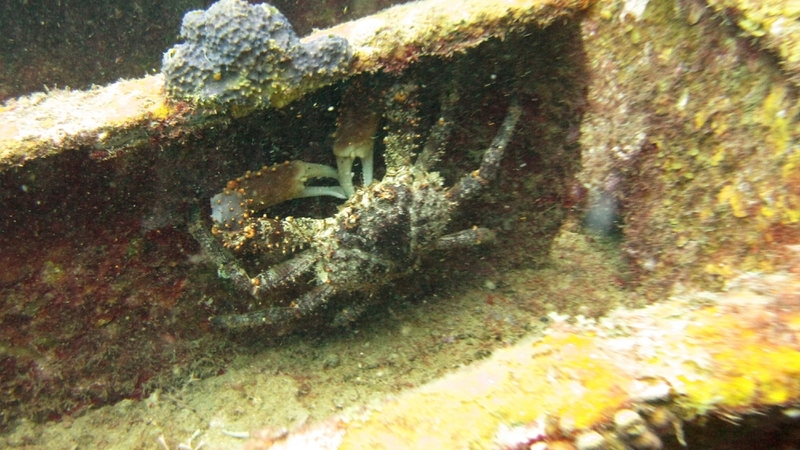 A couple of Arrow crabs and a Spotted Moray (Gymnothorax moringa) at Purple Rain. 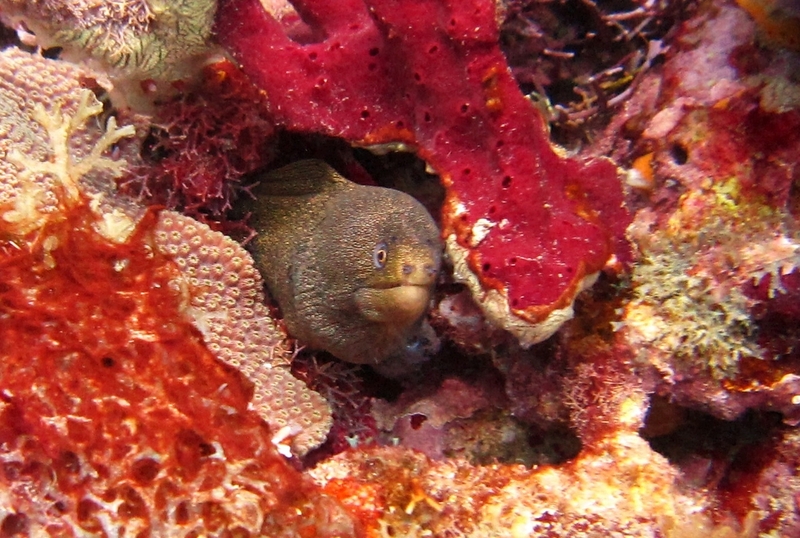 A Goldentail moray (Gymnothorax miliaris) at Dragon Bay in the Marine Protected Area. 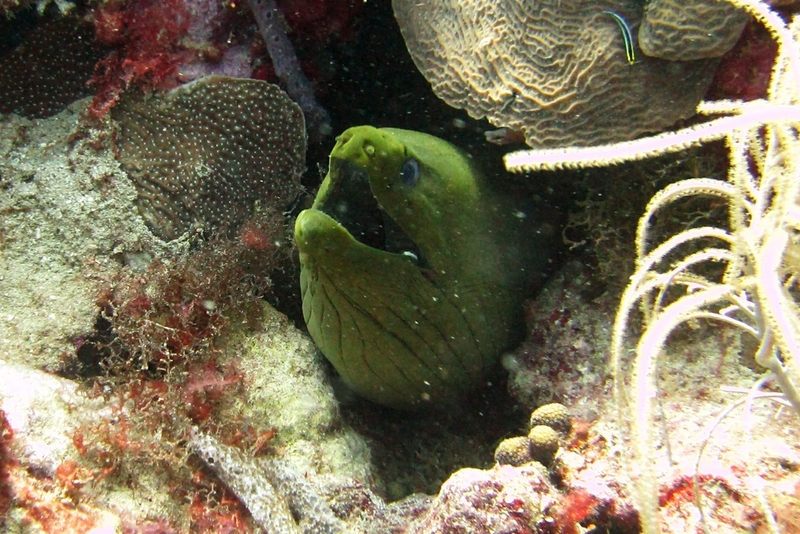 A Green moray (Gymnothorax funebris) at Purple Rain. 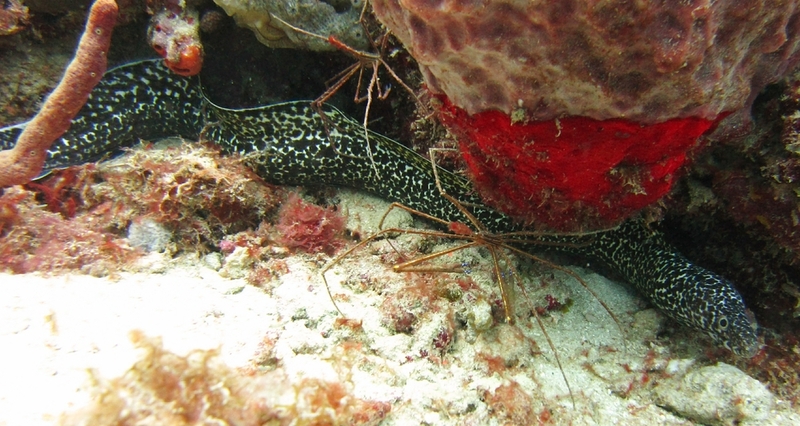 A Sharptail eel (Myrichthys breviceps) at Purple Sand. 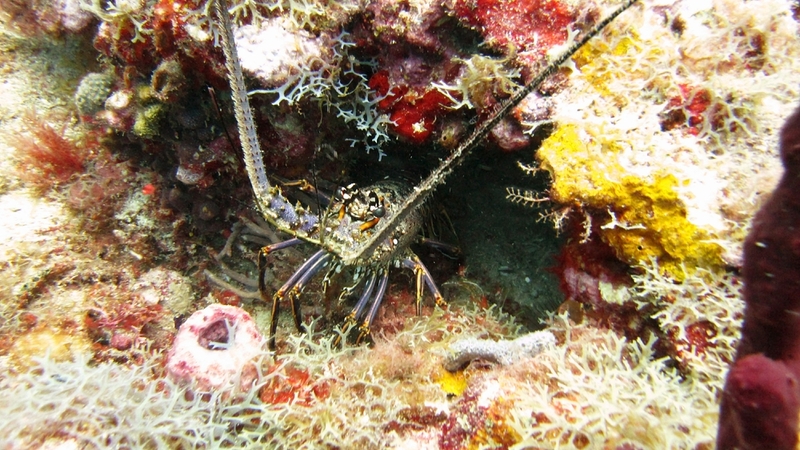 Caribbean lobster (Panulirus argus) at Purple Rain. And another at Black Forest. 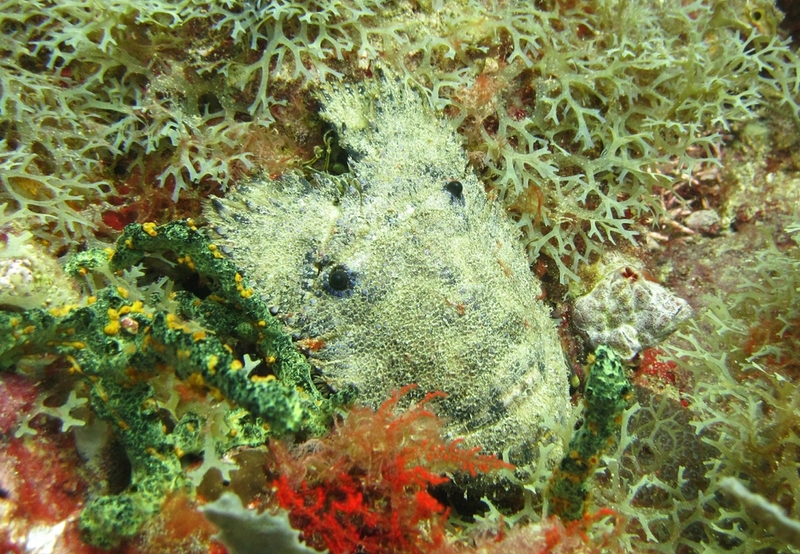 And another one just a few yards away. 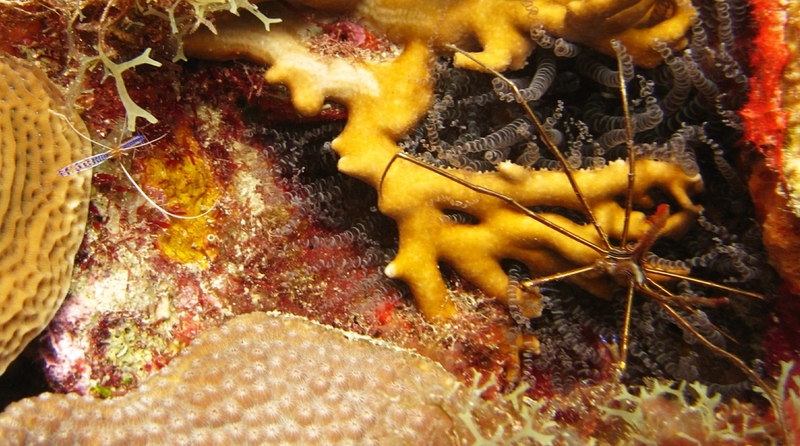 And a couple more share a crevice at Northern Exposure. 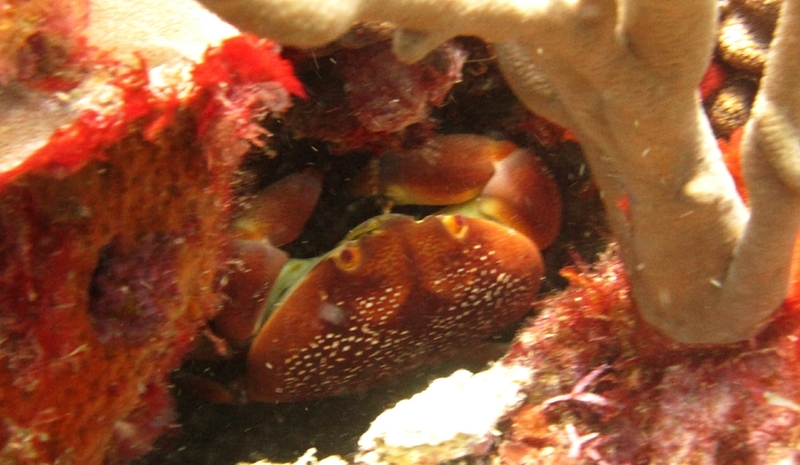 Batwing coral crab (Carpilius corallinus) hides in a crevice at Black Forest. 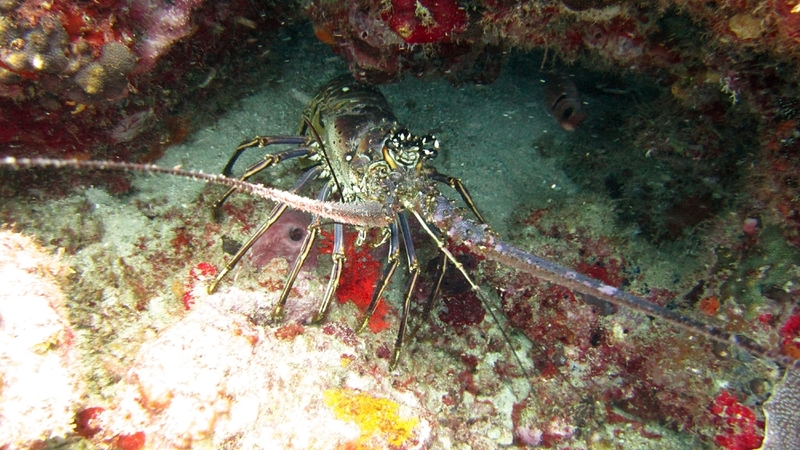 An unsettling-looking Sculptured slipper lobster (Parribacus antarcticus) at Black Forest. 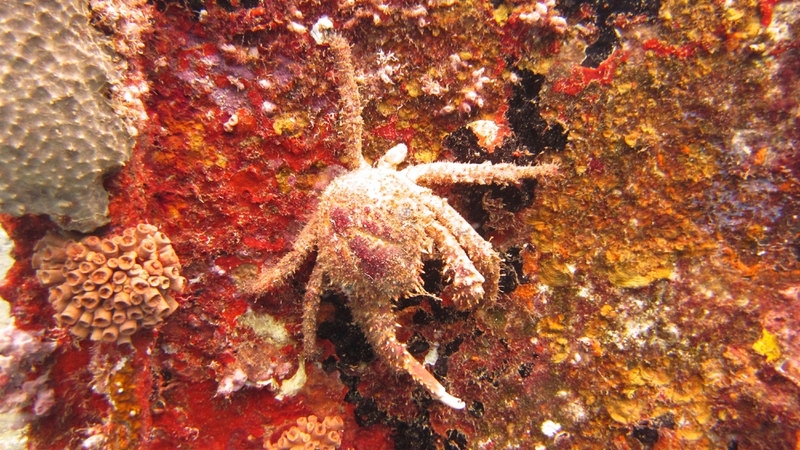 This crab (probably a Channel Clinging Crab - Mithrax spinosissimus) was clinging to a rusting vertical sheet of the superstructure of the Veronica L wreck. 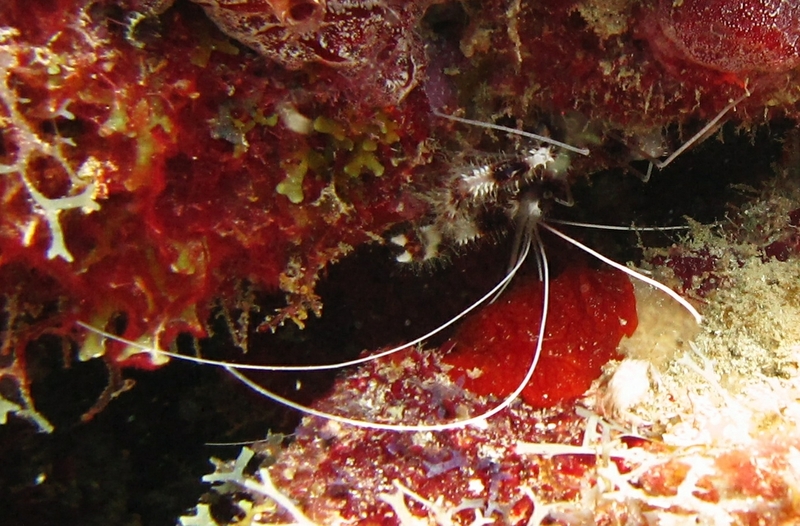 Probably a Red-Ridged Clinging Crab (Mithraculus forceps), also hiding in the hold of the Veronica L.